Five ingredients - the best! The creamiest in Podravka's chutney family, prepared according the traditional recipe that preserves the original taste. Only top quality ingredients are used for preparing this chutney. Only five ingredients, without preservatives and artificial additives. The best choice for people whose key criterion when chosing food is nothing but simplicity and excellence. Chutney (ajvar) is suitable for a modern combination of meals ingredients, but also for the preparation of traditional dishes. 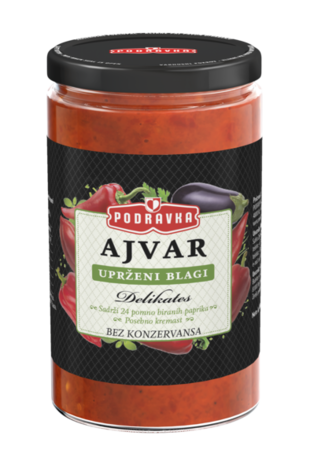 Can be used in its original form, as a side dish with grilled meats, sandwiches, hot dogs, sausages or as an additive to sauces, stews, soups,... show more Chutney (ajvar) is suitable for a modern combination of meals ingredients, but also for the preparation of traditional dishes. Can be used in its original form, as a side dish with grilled meats, sandwiches, hot dogs, sausages or as an additive to sauces, stews, soups, etc. or just as a spread. Storage: Keep protected from exposure to light. After opening keep in the refrigerator and use within 10 days. peppers (83%), aubergines (7%), vegetable oil, vinegar, sugar, salt, garlic, chilli pepper.